Future STEM teachers have a new student organization to participate in thanks to the diligent work of Kimberly Staples, associate professor of curriculum and instruction, and a group of her future science teachers. The student chapter of the National Science Teachers Association, or NSTA, was recently chartered at K-State, and the club's inaugural board of directors are: Ryan Bird, president; Quentin Clark, vice president; Zack Smith, publicity; and Nathan Booe and Sydney Malette, co-secretaries. The KSU-NSTA chapter hosted its kickoff invitational event Dec. 3. Dean Debbie Mercer welcomed the new organization into the college and spoke to the critical role we have in the preparation and mentoring of future science teachers for students in the state of Kansas. Membership in the KSU-NSTA student chapter is open to all currently enrolled students interested in STEM education, future K-12 STEM educators, as well as students majoring in science and engineering related fields. The student chapter is sponsored by the department of curriculum and instruction, which licenses secondary science teachers in the content areas of biology, chemistry, physics, and earth and space science. 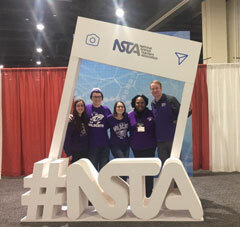 Staples and four future secondary science teachers — Bird, Kippley, Breanne Kruse and Samantha Huber — attended NSTA's annual conference last semester in National Harbor, Maryland. As chapter president, Bird said he is excited about what this means for science education. "This is a great opportunity to bring in not only education students but make the chapter more of a campuswide program," Bird said. "By bringing a chapter to K-State, we can enhance the science education program and create a bridge between STEM and three-dimensional learning." While in D.C., the group toured the Smithsonian National Museum of African American History and Culture. Staples, a Howard University alumna, reached out to the university's College of Education Dean Emerita Leslie Fenwick, a member of the museum's Scholarly Advisory Council, about tour arrangements. Fenwick presented the college's 2018 Distinguished Educational Research Lecture and encouraged faculty to tour the museum when possible. Fenwick and Howard President Emeritus Patrick Swygert facilitated the process, and Staples now envisions a continued relationship with K-State and Howard for future science teachers to experience the museum. "I'm really thankful for Kansas State giving us the opportunity to go out to D.C., and have this experience and go the African American History Museum," Bird said. "I consider myself knowledgeable with the history of African Americans in our country, but you really have no idea the impact of that history until you step into this museum. It was super powerful." On Dec. 7, new members of the KSU-NSTA chapter each presented a living legacy science and culture presentation to future STEM teachers, donors, College of Education faculty and staff, and retired science teachers. Educators and all future teachers interested in quality resources are encouraged to visit amnh.org and nmaahc.si.edu/learn/educators for additional tools and resources.